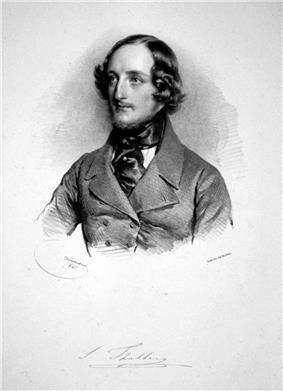 Sigismund Thalberg, Lithograph by Josef Kriehuber, 1841. Sigismond Thalberg (January 8, 1812 – April 27, 1871) was a composer and one of the most famous virtuoso pianists of the 19th century. 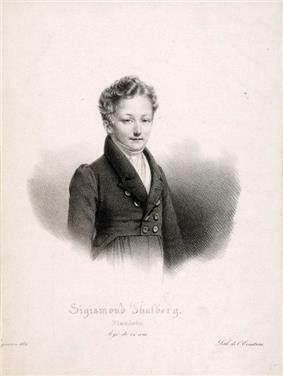 Sigismond Thalberg was born in Pâquis near Geneva, Switzerland, on January 8, 1812. According to legend, he was the illegitimate son of Prince Moritz Dietrichstein and Baroness Maria Julia Wetzlar von Plankenstern. However, according to his birth certificate, he was the son of "Joseph Thalberg" and "Fortunée Stein", both from Frankfurt-am-Main. Little is known about Thalberg's childhood and early youth. It is possible that his mother had brought him to Vienna at the age of 10, (the same year in which the 10-year-old Franz Liszt arrived there with his parents). According to Thalberg's own account, he attended the first performance of Beethoven's 9th Symphony on May 7, 1824, in the Kärntnerthortheater. There is no evidence as to Thalberg's early teachers. Baroness von Wetzlar, his mother, who according to Wurzbach was occupied with his education during his childhood and early youth, was a brilliant amateur pianist. It may be therefore that she gave him his first instruction at the piano. In spring 1826 Thalberg studied with Ignaz Moscheles in London. Moscheles, according to a letter to Felix Mendelssohn of August 14, 1836, had the impression that Thalberg had already reached a level at which no further help would be needed in order to become a great artist. Thalberg's first public performance in London was on May 17, 1826. In Vienna on April 6, 1827 he played the first movement, and on May 6, 1827, the Adagio and the Rondo of Hummel's concerto in B Minor. After this, Thalberg performed regularly in Vienna. His repertoire was mainly classical, including concertos by Hummel and Beethoven. He also performed chamber music. In the year 1828 his Op. 1, a fantasy on melodies from Carl Maria von Weber's Euryanthe, was published. In 1830 Thalberg met Mendelssohn and Frédéric Chopin in Vienna. Their letters show their opinion that Thalberg's main strength was his astonishing technical skills. Further information can be found in the diary of the 10-year old Clara Wieck. She had heard Thalberg on May 14, 1830, at a concert which he gave in the theatre of Leipzig. He had played his own Piano Concerto op.5 and a fantasy of his own. Two days before, Clara had played the first solo of the 2nd Concerto of John Field to him, and, together with him, the first movement of a four handed Sonata of Hummel. Her diary, edited by her father Friedrich Wieck, notes Thalberg as "very accomplished". His playing was clear and precise, also very strong and expressive. In the early 1830s Thalberg studied counterpoint under Simon Sechter. As a result, passages of canon and fugue can be found in some of Thalberg's fantasies of this time. An example is his Fantasy, Op. 12, on melodies from Bellini's opera Norma, which contains a march-theme and variations (one of them a canon), and a fugue on a lyrical theme. The fantasy was published in 1834 and became very popular; but on publication, it was criticised by some, for example by Robert Schumann. Thalberg successfully changed his composing style, reducing the counterpoint. Several works in his new style, among them the Deux Airs russes variés Op.17, were even enthusiastically praised by Schumann. In November 1835 Thalberg arrived in Paris. He performed on November 16, 1835, at a private concert of the Austrian ambassador Count Rudolph Apponyi. On January 24, 1836, he took part in a concert of the "Society of the Paris Conservatoire concerts", playing his "Grande fantaisie" op.22. Thalberg was praised by many of the most prominent artists, among them Rossini and Meyerbeer. Chopin didn't share his fellow artists' enthusiasm. After hearing Thalberg play, in Vienna, Chopin wrote: "He plays splendidly, but he's not my man. He's younger than I and pleases the ladies - makes potpourris on La Muette - produces his piano and forte with the pedal, not the hand - takes tenths as I do octaves and wears diamond shirt studs". Moscheles, Kalkbrenner, Chopin, Liszt and Herz are and will always be for me great artists, but Thalberg is the creator of a new art which I do not know how to compare to anything that existed before him ... Thalberg is not only the premier pianist of the world, he is also an extremely distinguished composer. On April 16, 1836, Thalberg gave his first solo concert in Paris, and the success was again sensational. According to Rudolph Apponyi's diary, Thalberg made a profit of 10,000 Francs, a sum which no virtuoso had gained before from a single concert. Liszt had heard of Thalberg's successes during the winter 1835–36 in Geneva, in spring 1836 in Lyon, and in Paris. In his letter to Marie d'Agoult of April 29, 1836, he compared himself to the exiled Napoleon. In a review of January 8, 1837, in the Revue et Gazette musicale, Liszt controversially denigrated Thalberg's compositions. After Thalberg returned to Paris in the beginning of February 1837, a rivalry developed between him and Liszt. On February 4, Thalberg heard Liszt play in concert for the first time in his life. Thalberg was stupefied. While Liszt then gave over a dozen concerts, Thalberg gave only one concert on March 12, 1837 in the Paris Conservatoire, and a further concert on April 2, 1837. In addition on March 31, 1837, both Liszt and Thalberg played at a benefit concert to raise money for Italian refugees. In May 1837 Thalberg gave a concert in London, following which The Athenaeum gave an enthusiastic review. Such enthusiasm followed Thalberg throughout the following years. His fantasy op.33 on melodies from Rossini's opera Moïse became one of the most famous concert pieces of the 19th century, and was still praised by Berlioz in his Memoirs (1869). The fantasy was published at end of March 1839 and in May 1839 studied by Clara Wieck who was delighted by it. In 1848 the fantasy was played by Liszt's daughter Blandine. After Thalberg's stay in London in May 1837, he made a first, short tour, giving concerts in several towns in Great Britain, but he became ill and soon returned to Vienna. In spring 1838 he gave concerts in Paris again. A note in the Revue et Gazette musicale of March 4, 1838, shows that Thalberg's fame had in the meanwhile grown. He was now called "the most famous of our composers". Thalberg left Paris on April 18, 1838, travelling to Vienna, the very day that Liszt gave there a charity concert for the benefit of the victims of a flood in Hungary. Thalberg invited Liszt for dinner, and the two great pianists dined together on the 28th with Prince Moritz Dietrichstein, who told Liszt, that he was delighted to have "Castor and Pollux" together in his home. During the evening, Thalberg remarked to Liszt with admirable candour : " In comparison with you, I have never enjoyed more than a succes d'estime in Vienna". They dined again the next day, after Liszt's concert on April 29, 1838. Liszt and Thalberg were both dinner guests of Metternich During Liszt's stay in Vienna Thalberg did not perform at all. In October 1838 Thalberg became acquainted with Robert Schumann. According to Schumann's diary, Thalberg played from memory etudes by Chopin, Joseph Christoph Kessler and Ferdinand Hiller. He also played with great skill and inspiration works by Beethoven, Schubert and Dussek, as well as Schumann's Kreisleriana, Op. 16 at sight. On November 27, 1838, Thalberg took part in a charity concert, playing his new fantasy, Op. 40, on melodies from Rossini's opera La Donna del Lago ("The Lady of the Lake" after Walter Scott). At one of his own "Farewell concerts" on December 1, 1838, he played three of his Etudes, Op. 26, his fantasy, Op. 33 on "Moïse" and his Souvenir de Beethoven, Op. 39, a fantasy on melodies from Ludwig van Beethoven's symphonies. As a result, in the Neue Zeitschrift für Musik of March 8, 1839, an enthusiastic review by Schumann of the second book of Thalberg's Etudes, Op. 26 appeared, concluding "He is a God when sitting at the piano." After Thalberg's "Farewell concert" in Vienna, he began his first extended European tour. On December 19 and December 21, 1838, he gave two concerts in Dresden, and he performed twice at the Court. Receiving honours from the King of Saxony, he told him "Wait until you have heard Liszt!" In Leipzig he gave a concert on December 28, 1838, attended by Mendelssohn who on the following day, in a letter to his sister Fanny, gave an enthusiastic account. Mendelssohn became a friend and admirer of Thalberg. After a second concert in Leipzig on December 30, 1838, Thalberg travelled to Berlin, to give a series of concerts there. Via Danzig, Mitau and other places he performed at St. Petersburg, receiving excellent reviews. From St. Petersburg he went on a steamboat to London where he gave further concerts. He then journeyed to Brussels, to meet his friend the violinist Charles de Bériot. There he gave several private performances. After Brussels, Thalberg arrived in the Rhineland, where he gave a series of concerts with Bériot. He returned to London at the beginning of February 1840, and then travelled from London to Paris together with Baroness Wetzlar, his mother, awaiting the arrival of Liszt. Thalberg had already announced in December 1838, during his stay in Leipzig, that he would take time off at the end of his tour, and did not perform at any concert during his stay in spring 1840 in Paris. Thalberg, with his composure, and within his more restricted sphere, is more nearly perfect as a real virtuoso; and after all this is the standard by which Liszt must also be judged, for his compositions are inferior to his playing, and, in fact, are calculated solely for virtuosi. After the end of the Parisian concert season, Thalberg travelled as tourist in the Rhineland. In the beginning of June 1840 he attended a music festival directed by Louis Spohr in Aachen. He got an invitation from the Russian Tsarina and performed at a court-concert in Ems, but this was his only concert during his stay in the Rhineland. According to a note in the Revue et Gazette musicale of August 2, 1840, p. 410, Thalberg's friend, the violinist Charles Auguste de Bériot, would get married two days later in Elsene (Ixelles). His bride was a young lady Maria Huber, born in Vienna, from Germany. She was an orphan and had been adopted by Prince von Dietrichstein, Thalberg's father. It may therefore be presumed that Thalberg wanted to take part in the wedding celebration. During previous visits to the Rhineland he wanted only to relax. He also taught Bériot's son, the pianist Charles-Wilfrid de Bériot. In the Revue et Gazette musicale of May 9, 1841, an essay by Fétis appeared, 'Etudes d'exécution transcendente', in which Liszt was praised for a new composing style which had been stimulated by Thalberg's challenge. In letters to Fétis of May 17, 1841, and to Simon Löwy of May 20, 1841, Liszt agreed with this analysis. Thalberg performed in Brussels in fall 1840. He then travelled to Frankfurt-am-Main where he stayed until January 1841. It had been announced that Thalberg would give concerts in Paris again in spring 1841, but he changed his plans. In Frankfurt he only took part in a charity concert on January 15, 1841, playing his fantasies on La Donna del Lago and Les Huguenots. He was busily composing new works; his Second Don Giovanni Fantasy op.42 and the fantasy op.51 on Rossini's Semiramide date from this time. 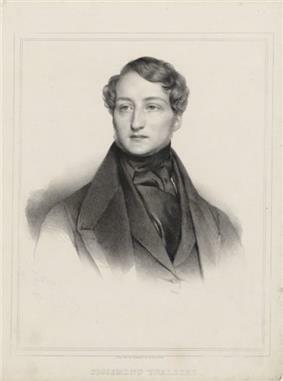 In the second half of January 1841, Thalberg travelled from Frankfurt to Weimar, where he performed three times at the Grand Duke's court and also in the Theatre. He then went to Leipzig, where he visited Mendelssohn and Schumann. On February 8, 1841, he gave a solo concert in Leipzig, enthusiastically reviewed by Schumann, playing his 'Second Don Giovanni Fantasy' op.42, his 'Andante final de Lucia di Lammermoor ', op.44, his 'Thême et Etude' op.45 and his Caprice op.46 on melodies from Bellini's La Sonnambula. On Monday Thalberg visited us and played to the delightment beautiful on my piano. An even more accomplished mechanism than his does not exist, and many of his piano effects must ravish the connoisseurs. He does not fail a single note, his passages can be compared to rows of pearls, his octaves are the most beautiful ones I ever heard. After his stay in Leipzig, Thalberg gave concerts in Breslau and Warsaw. He then travelled to Vienna and gave two successful concerts there. In a review in the Leipziger Allgemeine musikalische Zeitung, Thalberg was described as Liszt's only rival. In winter 1841–1842, Thalberg gave concerts in Italy, while Liszt, from end of December 1841 until beginning of March 1842, gave a series of concerts in Berlin. Thalberg matched Liszt's successes in Berlin. He then returned via Marseilles, Toulon and Dijon, arriving on 11 April 1842, in Paris. On the next day he gave his first, and on April 21 his second concert. According to an account by Berlioz, Thalberg made a profit of 12,000 Francs from his first, and of 13,000 Francs from his second concert. The concerts were reviewed in the Revue et Gazette musicale by Henri Blanchard who two years before, in his review of Liszt's concert on April 20, 1840, had nominated Thalberg as Cesar, Octavian or Napoleon of the piano. In spring 1842, Blanchard reached for new superlatives even surpassing his former ones. In his review of Thalberg's second concert he wrote, Thalberg would in 100 years have been canonized, and by all coming pianists be invoked with name of Holy Thalberg. According to the account by Berlioz, at the end of Thalberg's second concert a golden crown was thrown to the stage. In addition to his own concerts, Thalberg took part in a concert of Emile Prudent. He then travelled via Brussels to London. Later in 1842 Thalberg was decorated with the Cross of the French Legion of Honour. He travelled to Vienna where he stayed until fall 1842. In the second half of November until December 12, 1842, he made a further tour in Great Britain, and in January 1843 he returned to Paris. At end of March 1843 he performed at a private concert of Pierre Erard, but this was his only concert appearance during that season. His performance is so gentlemanly, so entirely without any forced acting the genius, so entirely without that well-known brashness that makes a poor cover for inner insecurity. Healthy women love him. So do sickly women, even though he does not engage their sympathy by epileptic seizures at the piano, even though he does not play at their overstrung, delicate nerves, even though he neither electrifies them nor galvanizes them. Shortly after Liszt's concert on May 11, 1844, Thalberg left Paris. He travelled to London and gave on May 28, 1844, a concert there. At a further concert in London he played a concerto for three pianos by J. S. Bach together with Moscheles and Mendelssohn. He also took part in a concert of Jules Benedict. In August 1844 he returned to Paris where he stayed until 1845. During the winter 1844–45 he gave a piano course for selected students at the Paris Conservatoire. On April 2, 1845, he gave a concert in Paris, playing his fantasies op.63 on Rossini's Barber of Seville, op.67 on Donizetti's Don Pasquale and op.52 on Auber's La Muette de Portici, as well as his 'Marche funèbre variée' op.59 and the 'Barcarolle' op.60. In spring 1848, in Vienna, Liszt met Thalberg once more. On May 3, 1848, Thalberg gave a benefit concert which Liszt attended. According to an account by his pupil Nepomuk Dunkl, Liszt was sitting on the stage, carefully listening and loudly applauding. It was 11 years since he had first heard his rival's playing. 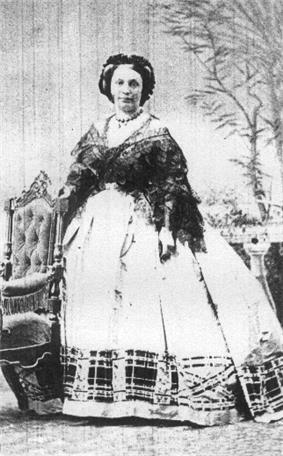 On July 22, 1843, Thalberg married Francesca ("Cecchina"), the eldest daughter of Luigi Lablache, first bass at the Théâtre des Italiens in Paris. Thalberg went with his wife to Italy where they stayed for the winter 1843–44. In 1855, after Thalberg's operas Florinda and Cristina di Svezia had failed, he realized his ambition to give concerts in America. From July to December 1855 he performed with overwhelming success in Rio de Janeiro and Buenos Aires. He returned to Europe, but after a stay of several months in Paris went on the steamboat Africa to North America, where he arrived on October 3, 1856, in New York. After Thalberg's debut there on November 10, 1856, a performance marathon ensued, during which he spent eight months giving concerts 5 or 6 days a week. Occasionally he gave two or even three concerts a day. On Sundays, concerts were generally only allowed if they presented "sacred music", but several times Thalberg performed anyhow, playing pieces like his Moïse-fantasy, based on a prayer from Rossini's opera, or his Huguenots-fantasy with the chorale "Ein feste Burg ist unser Gott" as main subject. His Andante op.32 and the Marche funèbre varié op.59 were also allowed. Thalberg's first American season ended with a concert on July 29, 1857, in Saratoga Springs, NY. On September 15, 1857, he gave another concert in New York, starting his second season. With very few intermissions he was busy until his last concert on June 12, 1858, in Peoria, IL. By then he had visited nearly 80 cities and given more than 320 regular concerts in the United States and 20 concerts in Canada. In addition, he gave at least twenty free concerts for many thousands of schoolchildren. Thalberg also gave a series of solo matinees in New York and Boston at which he played own works as well as chamber music. From 1857, the violinist Henri Vieuxtemps toured with Thalberg. They played works by Beethoven, and Duos composed by Thalberg. Thalberg ... quite unexpectedly closed what has been a most brilliant career - completely successful, musically, giving to the talented and genial artist abundance of both fame and money. There is probably not another virtuoso, whether with instrument or voice (Liszt alone excepted), who could have excited a moiety of the enthusiasm, or gathered a fragment of the dollars, which Thalberg has excited and gathered. The "unexpected close" referred to the announcement in June 1858 in Chicago that Thalberg would make only one of three scheduled appearances before immediately returning to Europe. In fact, Thalberg did not even perform at that concert, but very hastily left. His wife had arrived from Europe, following reports that Thalberg had an extra-marital liaison. The true reason why Francesca Thalberg had left for America in June 1858 and shortly afterwards, together with her husband, very hastily returned to Europe is unknown. The death of Thalberg's father in law, Lablache, on January 23, 1858, could be one reason. A further possibility is that there may have been consideration of legitimizing Thalberg to enable him to succeed his natural father Prince Franz Joseph von Dietrichstein. After Thalberg's return to Europe, he settled in Posillipo near Naples in a villa, which had belonged to Lablache. For the following four years Thalberg lived in silence there. In spring 1862 he gave concerts in Paris and London once again and was as successful as ever. After a last tour in Brazil in 1863 he put an end to his career. He suggested taking a position as piano professor at the conservatory in Naples, but it was defeated since an Italian nationality would be necessary. One year later he got an offer from the same conservatory which he refused. Vitale's claim that he published instructive editions of J. S. Bach's "Well Tempered Clavier" and Muzio Clementi's "Gradus ad Parnassum" has been recently disputed by Chiara Bertoglio. When he died on April 27, 1871, he left behind a collection of many hundreds of autographs by famous composers, among them Bach, Handel, Mozart, Haydn, Beethoven, Schubert and others, even Liszt. The collection was sold after Thalberg's death. 'Nobody in fact has been so much imitated; his manner has been parodied, exaggerated, twisted, tortured, and it may have happened more than once to all of us to curse this Thalbergian school'. Expressions like "exaggerated", "twisted" and "tortured" indicate that some contemporaries were starting feel jaded of his style. It was at this time when Thalberg's career as composer and as virtuoso came to an end. In the late 19th century, Thalberg's fame had come to depend on his association with a single piano technique, the 'three-hand effect'. Carl Friedrich Weitzmann, in his Geschichte des Klavierspiels (1879), wrote about this. 'His bravura pieces, fantasies on melodies from Rossini's Mosè and La donna del lago, on motifs from Bellini's Norma and on Russian folk-songs, became extraordinarily popular through his own, brilliant execution; however, they treat their subjects always in one and the same way, [namely] ... to let the tones of a melody be played in the medium octave of the keyboard now by the thumb of the right, now of the left hand, while the rest of the fingers are executing arpeggios filling the whole range of the keyboard'. The following example from the Mosè fantasy, apparently written after 1836, is typical of Thalberg's style of playing. Excerpt from Thalberg's Mosè fantasy illustrating the "three-hand" effect. While Thalberg was still in Vienna, in the Revue et Gazette musicale of January 8, 1837, Liszt's review of some of Thalberg's piano works appeared. Liszt claimed that in the Grande fantaisie op.22 the left hand continually played arpeggios and nothing else. The description was polemic, since in large parts of the piece the left hand plays a variety of firms: but thumb-melodies were not mentioned by Liszt. Fétis protested against Liszt's insinuation. But Thalberg had at his concert in the Paris Conservatoire on March 12, 1837, played for the first time played his Mosè fantasy. The audience noted a magical effect. They could see that in the finale Thalberg was playing a bass and accompanying with his left hand. His right hand was busily occupied with rapid arpeggios. But in addition, a broad melody was to be heard. Liszt's explanation of the thumb-melodies was accurate. This characterization of his style followed him until the end of his life. Thalberg by the late 19th century was often only characterised as "Old Arpeggio"; his musical innovations were unrecognised or had been forgotten. Others were tempted by the successes of Thalberg's works to inundate the musical world with imitations ad nauseam. In the end his reputation was submerged by the trivial productions of his imitators. ^ There are many variants of his name in use. Some authors wrote "Sigismund Fortuné François", whereas others gave only "Sigismund". In Italy he is usually called "Sigismondo"; and in France as well as in the English speaking world the most commonly used form is "Sigismond". Thalberg himself usually signed as "S. Thalberg", but at his wedding used the form "F.J.S. Thalberg"(See: Hominick: Thalberg, p.4. ), which can be inferred as "François Joseph Sigismund" or "François Joseph Sigismond Thalberg". Without pretending to decide which variant is to be regarded as correct, in the present article only the form "Sigismond" will be used. ^ See: Thayer: Beethoven Vol. 5, p.92. ^ Mendelssohn: Briefe an Moscheles, p.139. ^ Deutsch, Otto Erich: Schubert, Die Dokumente seines Lebens, Bärenreiter Kassel etc. 1964, p.421 and p.430. ^ Chopin: Correspondance I, p.243, and Mendelssohn: Briefe, p.118f. ^ Schumann's review of Thalberg's op.17 can be found in the Neue Zeitschrift für Musik of August 19, 1836, p.69. ^ Quoted after the translation in Hominick: Thalberg, p.9. ^ See: Apponyi: Journal III, p.231. ^ Liszt-d'Agoult: Correspondance I, p.147ff. ^ For contemporary reactions to Liszt's review see Dooley: The Virtuoso Liszt, p.52. ^ Liszt played the first movement of Hummel's Septet and his own Niobe fantasy; Thalberg played his Moïse fantasy. ^ See her letter to Schumann, in: Schumann: Briefwechsel II, p.522. ^ See the letter by Anna Liszt (Liszt's mother) to Liszt from June 20, 1848, in: Liszt: Briefwechsel mit seiner Mutter, p.411. ^ See Liszt's letter to Marie d'Agoult of April 30, 1838, in: Liszt-d'Agoult: Correspondance I, S.216; also see Liszt's letter to Lambert Massart of June 3, 1838, in: Vier: L'artiste - le clerc, p.45. ^ See: Liszt's own account in: Legány: Unbekannte Presse und Briefe, p.57. ^ See: Schumann: Tagebücher II, p.78f; also see: Schumann: Briefwechsel I, p.274. ^ See: Schumann: Tagebücher II, p.490f, n.305. ^ See for example Marie d'Agoult's letter to Henri Lehmann of September 26, 1839, in: Joubert: Correspondance romantique, p.35. ^ Mendelssohn: Briefwechsel mit Fanny, p.294f. ^ Quoted after the translation in: Hominick: Thalberg, p.73. ^ See: Jung, Hans Rudolf: Franz Liszt in seinen Briefen, Berlin 1987, p.78f, and Liszt: Briefe I, p.43. ^ See: Neue Zeitschrift für Musik 14 (1841), p.7f. ^ See the announcement in the Frankfurter Ober-Postamts-Zeitung 1841, p.108. ^ Translated from: Schumann: Tagebücher II, p.146. ^ Horsley: Reminiscences of Mendelssohn, p.355. ^ See: Neue Zeitschrift für Musik 16 (1842), p.171f, and Revue et Gazette musicale 1842, p.181. ^ See the note in the Revue et Gazette musicale of July 3, 1842, p.279. ^ See: Neue Zeitschrift für Musik 18 (1843), p.22. ^ See: Neue Zeitschrift für Musik 18 (1843), p.145f. ^ Quoted after the translation in: Hominick: Thalberg, p.44. ^ An account of the concert can be found in Horsley's Remininscences of Mendelssohn. ^ See the note in the Leipziger Allgemeine musikalische Zeitung 47 (1845), p.16. ^ See: Dunkl: Erinnerungen, p.19f. Hanslick, in his account of the concert in his Geschichte des Concertwesens in Wien, p.349, omitted Liszt's presence, but it is confirmed in a note in the Neue Zeitschrift für Musik 28 (1848), p.286. ^ Thalberg's wedding date is often reported as 1844. For the correct date see: Hominick: Thalberg, p.11; also see the note in the Leipziger Allgemeine musikalische Zeitung 45 (1843), p.608, and Marie d'Agoult's letter to Henri Lehmann of August 21, 1843, in: Joubert: Correspondance romantique, p.184. ^ See: Lott: From Paris to Peoria, p.159. ^ A repertoire list can be found in: Hominick: Thalberg, p.38f. ^ Quoted after: Lott: From Paris to Peoria, p.159. ^ On April 16, 1858, in New York, Elena D'Angri had given birth to a child who was suspected to be Thalberg's daughter. The girl was called Zaré Thalberg. On April 10, 1875, in the Royal Italian Opera in London, 'Zaré Thalberg' made a successful debut as Zerline in Mozart's "Don Giovanni".See the note in the Allgemeine Zeitung Augsburg 1875, p.1788. It has been suggested however that this girl's real name was Ethel Western and she had been born in England. See: Lott: From Paris to Peoria, p.158. ^ See: Protzies: Studien zur Biographie Franz Liszts, p.181 and n.1020. ^ The tour in Brazil is confirmed in the article "Thalberg" by Fétis. However, according to Hominick: Thalberg, p.17f, it seems to be doubtful, whether the tour actually took place. ^ See: Vitale: Thalberg in Posillipo. ^ See the article "Thalberg" in Wurzbach's Biographisches Lexikon, p.128ff. ^ See: Suttoni: Piano and Opera, p.207. ^ See: Hanslick: Geschichte des Konzertwesens in Wien. ^ Quoted after: Suttoni: Piano and Opera, p.207, where the date is erroneously given as 1854. ^ Quoted in: Dwight's Journal of Music XXI, August 16, 1862, p.153. ^ Translated after: Weitzmann: Geschichte des Klavierspiels, p.138. ^ The "Grande fantaisie" was by many authors confused with the Mosè fantasy; for a recent example see: Gooley: The virtuoso Liszt, p.24. ^ The letter was published in the Revue et gazette musicale of May 21, 1837. ^ See for example the article "Thalberg" by Fétis. ^ According to a further theory, Thalberg played the melody with the 5th finger of his left hand; see the article "Thalberg" by Wurzbach. ^ See: Suttoni: Piano and Opera, p.207f. Article "Thalberg" in The New Musical Grove. Article "Thalberg" in: Die Musik in Geschichte und Gegenwart. Article "Thalberg" in: Fétis, Francois Joseph: Biographie universelle des musiciens. Articles "Dietrichstein" and "Thalberg" in: Wurzbach, Constant v.: Biographisches Lexikon des Kaiserthums Österreich, Vols. III and VIII, Wien 1858 and 1882. Correspondance de Frédéric Chopin, * L'aube 1816–1831; ** L'ascension 1831–1840; *** La gloire 1840–1849; Recueillie, révisée, annotée et traduite par Bronislas Éduard Sydow en collaboration avec Suzanne et Denise Chainaye, Paris 1953–1960. Apponyi, Rodolphe: Vingt-cinq ans a Paris (1826–1850), Journal du Comte Rodolphe Apponyi, Attaché de l'ambassade d'Autriche a Paris, Publié par Ernest Daudet, * (1826–1830), Cinquième édition; ** (1831–1834); *** (1835–1843), Paris 1913–1914. Belance-Zank, Isabelle: The "Three-Hand" Texture: Origins and Use, in: Journal of the American Liszt-Society 38, 1995, p. 99–121. Bülow, Hans v.: Briefe, ed. Marie von Bülow, II. Band, zweite Auflage, Leipzig 1899.
d'Agoult, Marie (Daniel Stern): Mémoires, Souvenirs et Journaux I/II, Présentation et Notes de Charles F. Dupêchez, Mercure de France 1990. Göllerich, August: Franz Liszt, Berlin 1908. Gooley, Dana: The Virtuoso Liszt, Cambridge University Press 2004. Hanslick, Eduard: Geschichte des Concertwesens in Wien, Wien 1869. Hominick, Ian Glenn. : Sigismund Thalberg (1812–1871), Forgotten Piano Virtuoso, His Career and Musical Contributions, Ohio State Univ. 1991, DMA Diss. Horsley, Charles Edward: Reminiscences of Mendelssohn, in: Dwight's Journal of Music XXXII (1871/72), No. 19-21. Joubert, Solange: Une correspondance romantique, Madame d'Agoult, Liszt, Lehmann, Paris 1947. Kohlenegg, L. R. v. (Poly Henrion): Unter berühmten Menschen, Eine Mutter im Kampf und drei Genies im Bette, in: Ueber Land und Meer, 25 (1871), p. 18f. Legány, Desö: Franz Liszt, Unbekannte Presse und Briefe aus Wien, 1822–1886, Wien Graz 1984. Legouvé, Ernest: Liszt et Thalberg, une lettre de Liszt, in: Le Ménestrel of May 11, 1890, p. 145ff. Liszt, Franz: Briefe, Vol. VIII, ed. La Mara, Leipzig 1905. Liszt, Franz: Briefwechsel mit seiner Mutter, ed. Klara Hamburger, Eisenstadt 2000. Liszt, Franz: Sämtliche Schriften, ed. Detlef Altenburg, Vol. 1: Frühe Schriften, ed. Rainer Kleinertz, commented with collaboration of Serge Gut, Wiesbaden 2000. Liszt, Franz, and d'Agoult, Marie: Correspondance, ed. Daniel Ollivier, Vol. 1: 1833–1840, Paris 1933, Vol. II: 1840–1864, Paris 1934. Mendelssohn, Fanny and Felix: Briefwechsel 1821 bis 1846, ed. Eva Weisweiler, Berlin 1997. Mendelssohn Bartholdy, Felix: Briefe, ed. Rudolf Elvers, Frankfurt 1984. Mendelssohn Bartholdy, Felix: Briefe an Ignaz und Charlotte Moscheles, ed. Felix Moscheles, Leipzig 1888. Mühsam, Gerd: Sigismund Thalberg als Klavierkomponist, Wien 1937, Phil. Diss. Protzies, Günther: Studien zur Biographie Franz Liszts und zu ausgewählten seiner Klavierwerke in der Zeit der Jahre 1828–1846, Bochum 2004, Phil. Diss. Schumann, Clara und Robert: Briefwechsel, Kritische Gesamtausgabe, ed. Eva Weissweiler, Vol. I, 1832–1838, Vol. II, 1839, Basel Frankfurt a. M. 1984, 1987. Schumann, Robert: Tagebücher, Vol. I, ed. Georg Eismann, Vol. II ed. Gerd Nauhaus, Leipzig 1971, 1987. Suttoni, Charles: Piano and opera, A Study of the Piano Fantasias Written on Opera Themes in the Romantic Era, New York 1973. Thayer, Alexander Wheelock: Ludwig van Beethovens Leben, auf Grund der hinterlassenen Vorarbeiten und Materialien weitergeführt von Hermann Deiters, herausgegeben von Hugo Riemann, Fünfter Band, Leipzig 1908. Vier, Jaques: L'artiste - le clerc: Documents inédits, Paris 1950. Vitale, Vincenzo: Sigismondo Thalberg in Posillipo, in: Nouve rivista musicale italiana 6, 1972, p. 503–511. Walker, Alan: Franz Liszt, Volume 1, The Virtuoso Years 1811–1847, Revised Edition, New York 1987. Wieck, Clara: Jugendtagebücher 1827–1840, ed. Gerd Nauhaus and Nancy B. Reich, Wiesbaden etc. Breitkopf & Härtel.